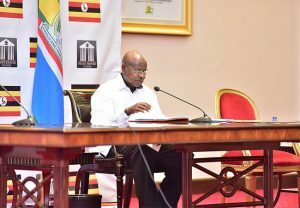 President Yoweri Museveni has urged the European Union (EU) to support Uganda’s efforts to relocate people from wetlands and forests and avert environmental degradation and landslides. “When Hon. Kuteesa was at the UN, I tasked him with fundraising for this cause. We want to remove people from the wetlands. He raised US$22million. Support us to relocate these people,” the President said, adding that the recent landslide in Bududa District has woken up the population there and now they are ready to move. The President and the European Union delegation held their annual political dialogue meeting in accordance with Article 8 of the Cotonou Partnership Agreement and forms part of regular political dialogue between Uganda and the EU on global, regional and national issues. The European Union Ambassador to Uganda, H.E. Attilio Pacifici, who led the delegation, had earlier condoled with the President and the people of Uganda following the landslide disaster in Bududa District in which over 55 people are confirmed to have perished and hundreds displaced. He said the EU has already availed maps of Mt. Elgon from their world satellite to gather more information. The delegation included Heads of Missions of Austria, H.E. Gunter Engelits, Belgium H.E. Hugo Verbist, France H.E. Stephanie Rivoal, Ireland, H.E. William Carlos, Italy H.E. Domenico Fornara, Germany H.E. Albrecht Conze, the United Kingdom H.E. Peter West, Poland, H.E. Jacek Bazariski, Czech Republic, H.E. Pavel Rezac, Netherlands H.E. Henk Jan Bakker, Sweden H.E. Per Lindgarde and Ms. Majbrit Holm Jacobsen, the Charge d’Affaires of the Danish Embassy. The President and the Ambassadors talked about regional issues such as security in South Sudan, Somalia and the Democratic Republic of Congo (DRC), climate change, trade and investment climate, among others. President Museveni called upon the Ambassadors to encourage companies in their countries to invest in Uganda citing that there is need to create employment for the youth. He assured them that he is handling the issue of the Uganda Investment Authority to stop the infighting for investor confidence. The EU delegation commended President Museveni and the Government of Uganda for the commitment towards finding peace in the region to facilitate trade and development and hospitality towards the refugees. Prime Minister Dr. Ruhakana Rugunda, Foreign Affairs Minister, Sam Kuteesa, that of Finance and Economic Planning, Matia Kasaija, Attorney General, William Byaruhanga, Security Minister, Elly Tumwiine, National Resistance Movement (NRM) Secretary General, Justice Kasule Lumumba and other senior government officials, attended the meeting.